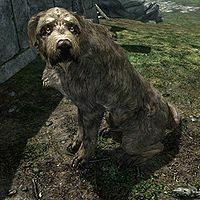 Dogs are found throughout Skyrim. A dog will attack you if it is owned by a hostile NPC. You can occasionally find stray dogs in the wild that can be provoked into attacking you. HuskiesDG and Death HoundsDG are generally found accompanying NPCs, although Death Hounds only ally themselves with vampires. Certain dogs can also be recruited as potential followers throughout the game. You can have at most one canine follower at any time. If your dog is left waiting for too long, a message will appear stating that it has grown tired of waiting and will start walking to its original location. Most dogs (including stray dogs, Meeko, purchased dogs, and armored HuskiesDG) can be brought home as a follower and adopted by your children as a pet with the Hearthfire add-on installed. A dog companion told to go home will go home to its own original home, or your first encounter area, not any of your homes. This appears to have been the intended behavior, unless it was adopted by your children. The hitbox of a dog is larger than the dog's visual appearance would suggest; thus, if a dog is between you and an intended target, you may hit the dog even when it appears to be peripheral to your line of sight. If a dog follower gets adopted by your children, it may wander off to the wrong house. This seems to happen when dismissed outdoors and when your family lives in one of the three homes added by Hearthfire. It may also happen if the dog is already adopted and you move the family to one of the Hearthfire homes. To resolve this, find the dog and ask it to follow you, walk home, go indoors, and tell it to wait there. Even after two game days pass, it will still be there. Dismissing the dog in the house might also work. PC users can find the dog by using the console command player.moveto <dog id>, but even without it you should find the dog wandering around near one of the other homes. This page was last modified on 19 May 2018, at 14:33.